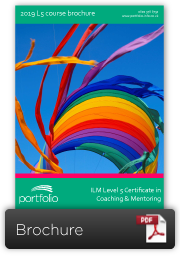 The ILM’s Level 5 Certificate in Coaching & Mentoring qualification aims to provide practising managers with the knowledge, skills and confidence to perform effectively as management coaches or mentors and to gain an awareness and practical ideas of how to successfully introduce coaching into the workplace. This powerful and very practical programme uses up-to-the minute research, tools and techniques to develop the twin themes of individual coaching competence and coaching in an organisational context. Explores the management of coaching as well as developing the skills, confidence and competence of those coaching at a managerial level. Experienced first-line managers who may be “stepping up” into a middle-management role where coaching will form part of their everyday management activity. This Level 5 qualification is broadly comparable academically with Year 2 of a 3-year degree programme and our programmes feature the latest ILM curriculum. Student testimonials: Our students are our greatest advocates; please contact us for references. "So engaging - discussions were incredibly valuable and wide-ranging. Fantastic programme." When and where? Our open programmes are held at Wroxall Abbey Estate, Warwickshire, CV35 7NB. Entry is via application only. This programme is also available on an in-company basis; contact us for details. Access to our open programmes is strictly via application ; click here to access online form. More info: Click here for details of our standard open programme brochure (including fees) Our L5 Certificate programme is also available on an in-company basis, subject to availability. Call 07919 006607 to speak to Jane Harders, Lead Tutor. Have any questions? View or download the brochure (top right of this page), check out Why study with us? and FAQs or call us on 0800 978 8750. You are clearly a master of your profession; you're an inspiration to coaches everywhere.